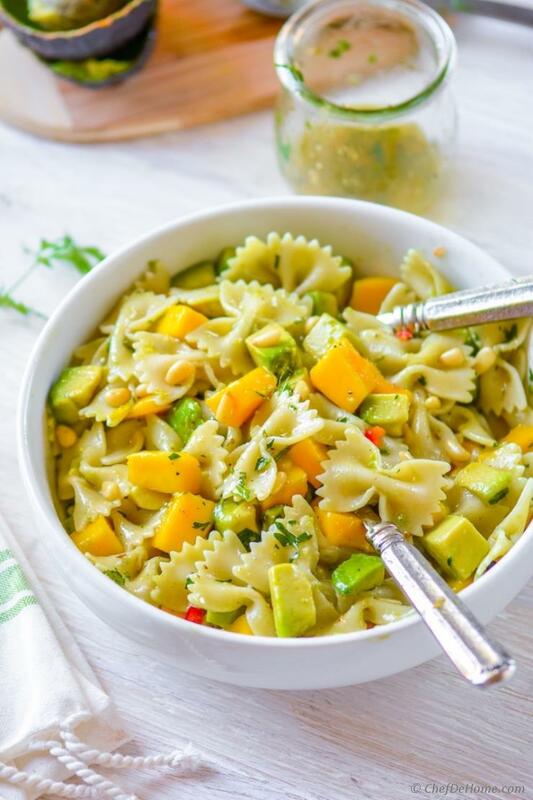 Healthy fresh take on pasta salad with creamy avocado, sweet mangoes and zesty flavorful cilantro-lime dressing. dairy-free, vegan, and can be gluten free! Healthy fresh take on pasta salad with creamy avocado, sweet mangoes and zesty flavorful cilantro-lime dressing. 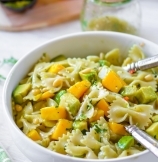 Every fork-full of this pasta salad has something delicious to enjoy - lime-soaking creamy avocados, juicy mangoes, farfalle pasta, and crunchy pine nuts. This is one avocado salad which you can easily carry to potlucks or BBQ parties! Flavor-packed cilantro-lime dressing not only makes mangoes and avocados extra delicious.... it also preserve the color (prevent oxidation) of sliced avocados. Result? A perfectly fresh salad even after 5 hours of travel! How good does that sound? 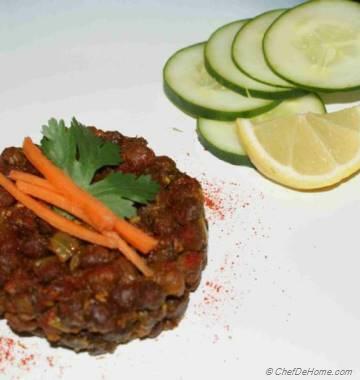 Oh, and this salad is dairy-free, vegan, and can be gluten free! Why am I sharing a Pasta Salad today?! Well, one because I "love" salads and second because, recently I had access to Farmer's Market fresh avocados and cilantro! This avocado and mango salad was my lunch over the weekend. So I thought why not share this summer-fresh pasta salad with you all! For today's salad I bought some fresh avocados, fresh herbs and some organic pasta. Until last week, I was sharing weekly theme recipes..... but this week I lost the momentum due to some unforeseen reasons. Actually it's okay for a bit of surprise every few week. Isn't it? So, since not following a theme, this avocado salad fit right in. As sun is shining bright and spring has sprung.... a fresh sunny salad like this one for perfect for my lunch. So I thought to spread some sunshine to you as well. I like to enjoy this salad, chilled, with extra splash of cilantro-lime dressing and that's how I'm sharing it with you. 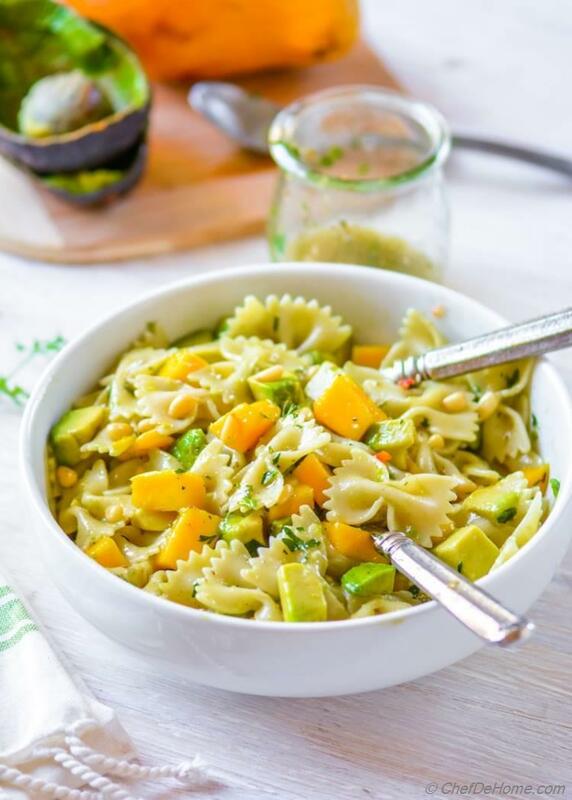 A filling touch of healthy fats of avocado, tangy-juicy mangoes, farfalle pasta and zippy cilantro-lime dressing! Just 10 minutes prep and lunch is served. Oh, and this pasta salad is also great for packing to potlucks or outdoor BBQ parties. Cilantro Lime Dressing not just adds zing in this simple salad but also prevents sliced avocados from blackening quickly. If you like to assemble this salad a night ahead... for next day lunch/potluck? I would suggest mixing everything else but avocado and 1/4 cup of dressing. In morning, add sliced avocado mixed in remaining dressing and this salad will easily sat fresh for next 5-6 hours. 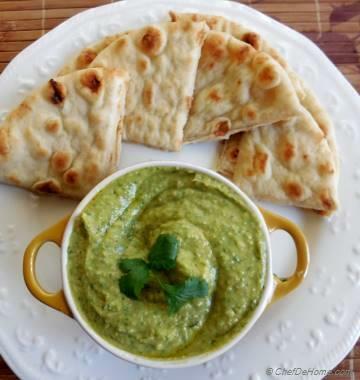 Cilantro-Lime dressing doubles easily. 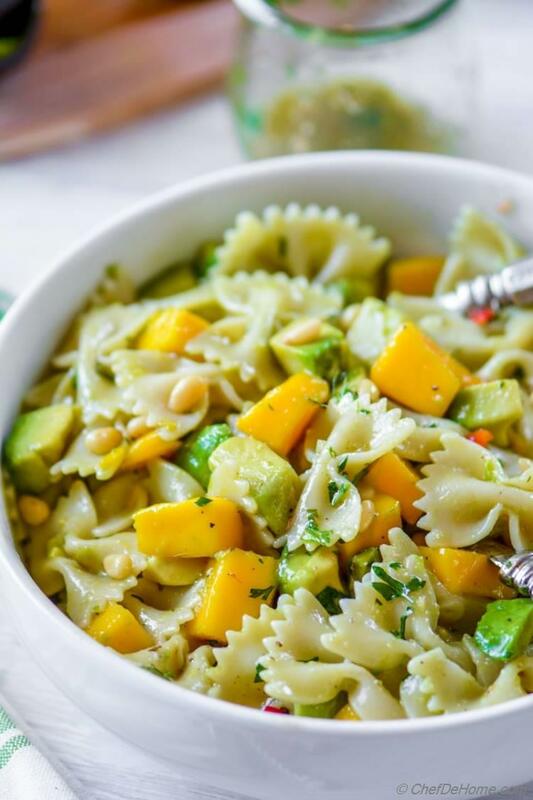 If you love avocados and mangoes and often buy some extra like I do :) Then, make an extra batch of dressing and mix fresh into next day's Mango Avocado pasta salad . I'm sure you guys too love repeating favorite salads for lunch twice in week! Well, I love too! So i always have some extra dressing in refrigerator. Vegan? Such simple and fresh flavored salad does not need any cheese or dairy. Avocados keep every bite of this salad creamy and rich without any dairy calories. So, yes, this salad is vegan. Gluten Free? To make it gluten free, use gluten free buckwheat pasta or veggie pasta. I cannot end this post without sharing a few words about a yummy juicy ingredient of this salad i.e. mangoes. This is the first batch of seasonal ripe and sweet mangoes I found in store last weekend. I must say, as the name suggest, this salad is not "Mango Avocado Salad" if it does not have mango and avocado. Le me quickly sum up why you should try this salad, this weekend! 1. A simple salad with lots of fresh flavor. Ready in just 20 minutes! 2. This salad doubles easily. Perfect to make for potlucks. 4. Healthy salad with omegas from avocado and no dairy calories. You guys! Just when typing this post, it clicked me that actually this salad is not out of theme. Humor me if I say, I have a Mexican Street-fair brunch planning for you! Serve Cauliflower Rice Tacos with side of Mango-Avocado Pasta Salad. Finish with Chocolate Churros topped with whipped strawberry cream! yumm! Few more delicious Pasta Salad from my recipe repertoire! Total Time 20 minutes Prep Time 10 minutes Cook Time 10 minutes Difficulty Easy Yields 4 Servings Serves 4 Notes No. of servings depends on serving size. Smart Swap Add some chopped celery or apple for extra crunch. 1. Bring pot of water to rolling boil, season with salt and cook pasta until just al-dente (10-12 minutes). Or follow direction of cooking pasta on the package. 2. While pasta is cooking, in a food processor jar, combine all cilantro lime dressing ingredients and pulse to a well blended dressing. Transfer to a bowl and set aside. 4. Add diced avocado, mango, celery (if using), rest of cilantro lime dressing, fresh chopped cilantro, and toss well. Top with toasted pine nuts, serve immediately or refrigerate until ready to serve! Why can't I print this recipe using the PRINT button?? Can you please share your Browser name? I'm able to print it just fine. Thanks. What a fab salad, I love these flavors and the mango sounds so good! I don't often eat Pasta but since stopping by this post, Definitely try this dish soon. Thanks so much for a great combination. thanks, Thanh! I'm glad you enjoy these flavors. Would you recommend adding any greens/lettuce to make a more traditional salad? If so what kind and when would you recommend adding? Hi Melanie, I often add chopped kale in this salad. So, to answer your question, you can add greens. 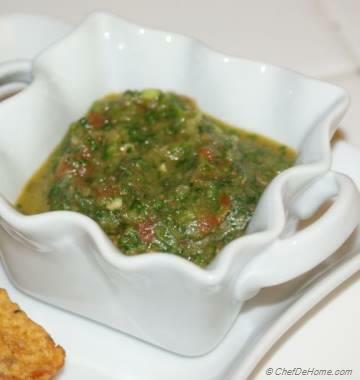 Sturdy greens such as kale, frisee can be added while mixing in mangoes/avocado (step 4). Lettuce will also go good with cilantro-lime dressing. I would mix it in just before serving. I hope it helps. It sounds really fresh and delicious, I am keeping this in mind for the summer. thanks for such sweet words, Adina! I'm glad this salad will make to your summer menu! :) Have a wonderful day!